This week we’re out on the road again, recording from The Hoop & Grapes in Farringdon and we’re joined by guest John West from the I’ll Explain Later podcast. Hopinions | Are ‘go to’ beers a part of your drinking regime? Many thanks to John from Shepherd Neame and Mike from the Hoop & Grapes for providing the room for recording and the beers that we had for free. This didn’t impact on our views of the beers that we had. Happy Birthday to us! We’re 3 years old and in the first of our summer specials for this year we celebrate our birthday with a very special beer, Shepherd Neame’s ‘Mash Tun No 1’. If that wasn’t enough, we’ve also got serial guest Justin Mason to share the beer with us and we’ve got loads of birthday messages from our legion of fans. There’s a very special #prizelessprize and we look forward to the other specials we’ve got coming this summer. If you enjoy the show please take some time to complete our listener survey and to nominate us for the UK Podcasters Awards. Cheers, Mark & Steve. A return to days of olde, with a supermarket staple this week – Shepherd Neame’s Bishops Finger. We’re joined by beer blogger and all-round good bloke, Glenn Johnson. We look forward to the GBBF and Steve champions the cause of his local beer festival. Plus we chat to Ian from 11pm Somewhere podcast about the forthcoming Lock In supported by Thornbridge. No #PrizelessPrize this week due to holidays but keep the entries coming on Instagram with #CheersGuys . Also, the usual beery news and chatter – it’s beer o’clock! 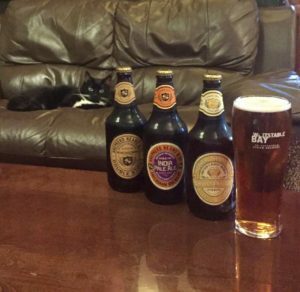 This week we’re joined by Beer O’Clock Show’s #1 Fan, @Stath79 – aka Antony – for a tasting of a Shepherd Neame classic – Spitfire! How will Steve handle such a full-tasting experience with *two* of his protege’s sitting as his feet, awaiting his wisdom? Listen and find out. Coupled with our usual beery chatter and reflection, it’s Beer O’Clock!